B&H assembled the Celestron Labs S20 Stereo Microscope Digiscoping Kit for students and hobbyists to view larger 3D specimens like coins, rocks, jewelry, or watches, then capture photos or videos for sharing or inclusion in projects and reports. The kit includes Celestron's microscope and their basic smartphone digiscoping adapter that fits over one of the eyepieces. 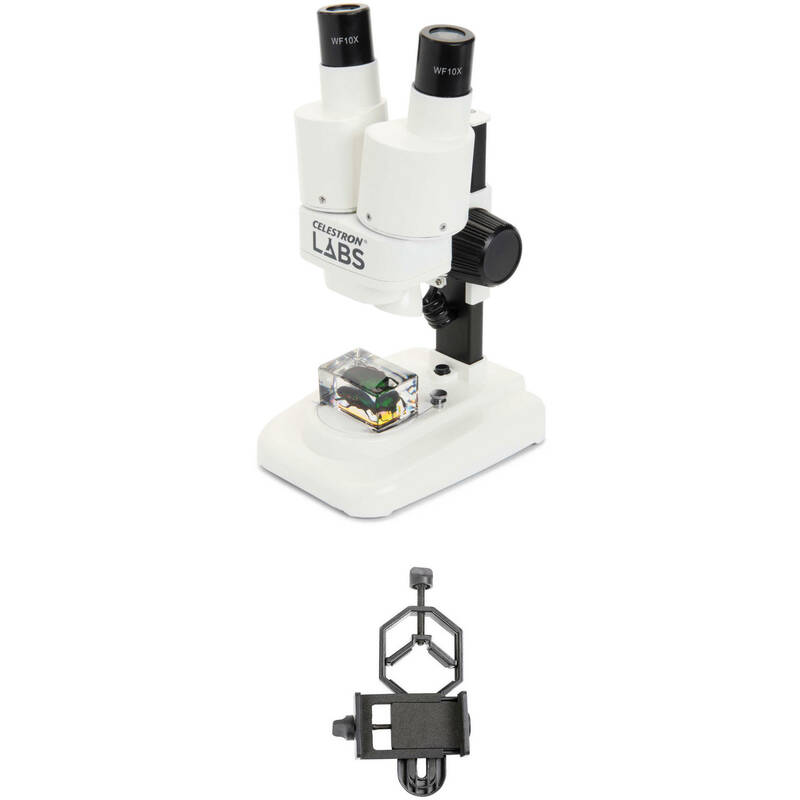 Designed as an entry-level instrument for students and hobbyists, Celestron Lab's S20 Stereo Microscope is a versatile optic that is ideal for making 3D observations of a variety of subjects such as coins, minerals, insects, leaves, textiles, and documents. Dual eyepieces preserve stereoscopic vision, which renders images in three dimensions, as opposed to a flat field common in single-ocular microscopes. It has a magnification of 20x with a maximum working distance of 2.76". The head and nosepiece are attached to the microscope's pillar and are easily adjustable to set the correct working distance to achieve the sharpest focus. Specimens are illuminated from above with a space-saving and energy-efficient LED emitter. The S20 is battery powered, making it ideal for use in the field. Box Dimensions (LxWxH) 11.15 x 7.15 x 5.75"